So it's almost Diwali. Even though we don't celebrate it, we enjoy the food that comes with it. After trying out a few sweet and savory recipes for Diwali over the last five years, I've come to realize that a lot of recipes are fairly quick and easy to make, compared to most of the traditional Goan sweets. That makes me happy because I know I can whip up so many treats in a jiffy. However, there are a few recipes that are time consuming and tedious when made from scratch, like a good peda. A peda, for those of you who aren't familiar with the term, is a hand shaped piece of fudge made and enjoyed all over India. Now, I have made fudge before but had never tried making Pedas at home. That is, until I recently came across a recipe for an Instant version. Yup, you heard me, there is an instant version of the good old peda. 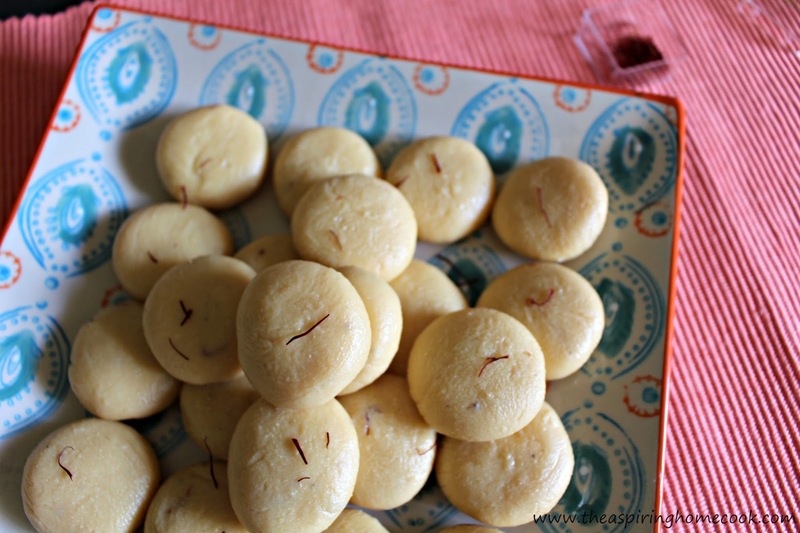 This Instant Kesar Peda requires a few basic ingredients and about half an hour of your time. That's how easy and simple it is to make. A lot of the commercially sold pedas use food coloring and artificial flavoring, but I decided to keep mine simple. I have used actual Saffron strands in this recipe for flavor and a mild coloring too. If you want your pedas to have the 'oh-so-popular' color, use some yellow food color. You can choose to imprint a design on the top of the peda or use a mould to shape it and you have the option to garnish the shaped pedas with some finely slivered nuts as well. So if you still haven't whipped up anything for Diwali, don't let that get you down. You can still make a bunch of homemade sweets and savories for your Diwali platter in no time at all. Besides this peda recipe, I have a few fantastic recipes to help you out. You can find them at the end of the post here. So here's to another Indian delicacy, even though its a cheat version. I can tick this one of the my ever-growing list of recipes I want to try. Wish you and your family a Happy and Prosperous Diwali!!! 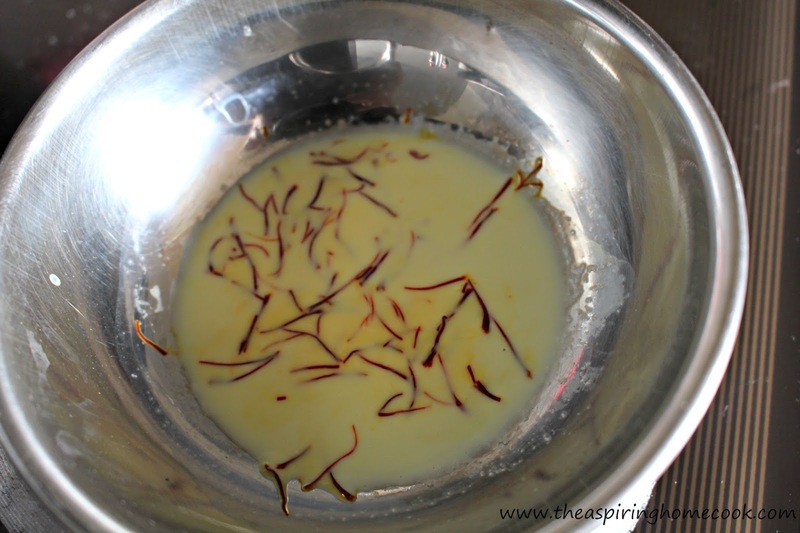 Add the saffron strands to the warm milk and set aside to infuse. Grease a large plate with a tiny bit of ghee and set aside. In a wide, preferably heavy bottomed pan, heat the ghee on a medium flame till it melts. 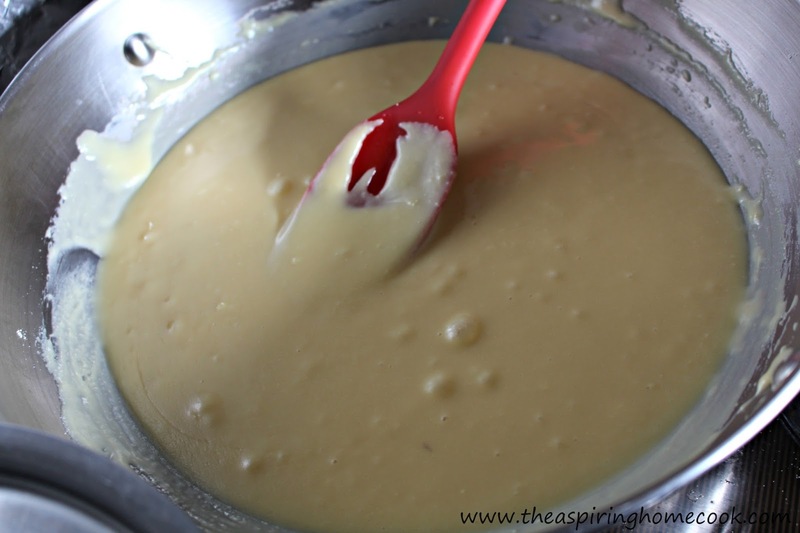 Add the condensed milk and the milk powder to the pan and stir well, making sure you dissolve any lumps that form. Any lumps left will not give you a smooth finish. Continue cooking the mix, stirring frequently (with a wooden or a silicon spoon) for about 8-10 minutes. You will find the mix coming together at this stage. Add the saffron infused milk and strands and the crushed cardamom to the pan and stir well. This will cause the mix to loosen in consistency a little and that's exactly what we want. Continue cooking for a few more minutes, stirring continuously and the mix will start pulling away from the sides of the pan. At this stage carefully check to see if the mix is still sticky. I picked a tiny portion with the spoon and touched it lightly to see if it is sticky. My hands can tolerate a fair amount of heat, please exercise caution when doing this. You want to make very little contact with the mix and not dip your finger in it too deep because it is super hot at this stage. If it still feels too sticky, continue cooking for a couple minutes more. Once it is not sticky, take off the heat. Immediately turn the mix onto the greased plate and leave it to cool a little. When it is cool enough to handle, grease your palms with a little ghee, pinch of a small portion of the mix and roll into a ball and flatten slightly. Place on a platter and leave to set. If you choose to garnish the pedas, do it at this stage just after you shape it and then set aside in a single layer to set.